Page added in March 2015. In 1863 the construction of the railway station led to the first demolitions of the walls which protected Ravenna. They were built by Emperor Honorius in the Vth century AD, but they were largely modified in the following centuries. Today only minor sections of the walls survive. They look rather low and are not particularly impressive, because the moat which surrounded them no longer exists. During the first half of the XVth century the Republic of Venice greatly expanded its mainland territories by acquiring Padua, Verona, Cividale and other important towns. In 1441 the Venetians ousted Ostasio da Polenta, ruler of Ravenna, and occupied the town. In 1454 the conquest was confirmed by the Treaty of Lodi, a general peace agreement signed by the main Italian states. 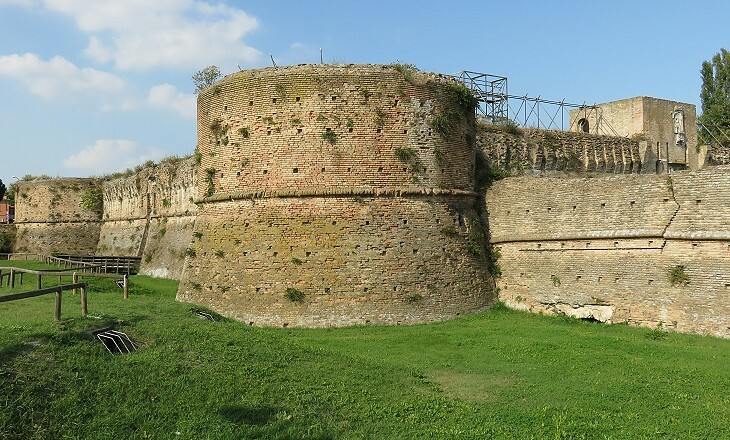 In 1457 the Venetians began the construction of a modern fortress at the north-eastern end of Ravenna on the southern bank of the River Montone, which at the time was navigable by small ships. This aspect was very important for the Venetians, because Ravenna was separated from the other territories of the Republic by the Duchy of Ferrara and it could not be easily supplied by land. The fortress was made up of a citadel and of a keep with four large circular towers which projected from the walls. It was perhaps named after the Winged Lion's paw (It. branca). The design of the keep was influenced by one of the "lessons learned" from the fall of Constantinople, where the ancient walls had failed to prevent the Ottoman conquest of the city in 1453. From a legal point of view in 1441 Ravenna was a possession of the Popes, but their power had been weakened by the Great Schism and in addition Eugenius IV, the ruling pope, belonged to a Venetian family. In 1451 the matter was settled and Pope Nicholas V acknowledged the Venetians as his vicars at Ravenna in return for a yearly payment of 300 gold ducats. It. serrato means locked and this gate which is situated very near Rocca Brancaleone was closed by the Venetians to strengthen the defence of Ravenna. In 1508 Pope Julius II promoted the League of Cambrai, an alliance with France, the Holy Roman Empire and Spain, aimed at curbing Venetian power. 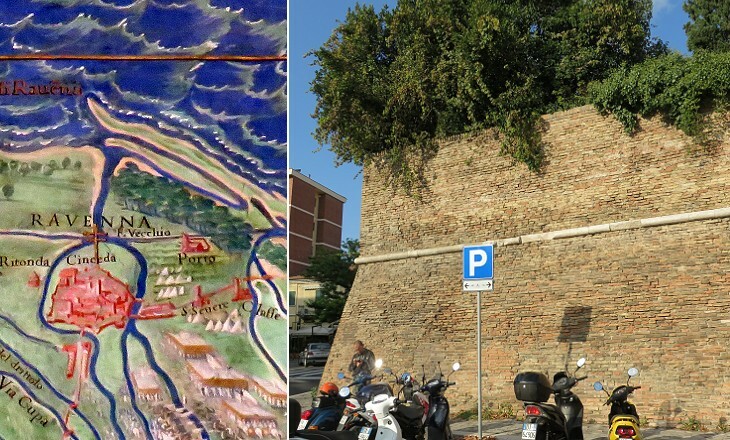 In 1509 he seized Ravenna and in 1511 he reopened Porta Serrata. In 1512, after the Pope switched sides and allied with Venice, the French conquered and thoroughly sacked the town. Eventually Ravenna became an integral part of the Papal State. 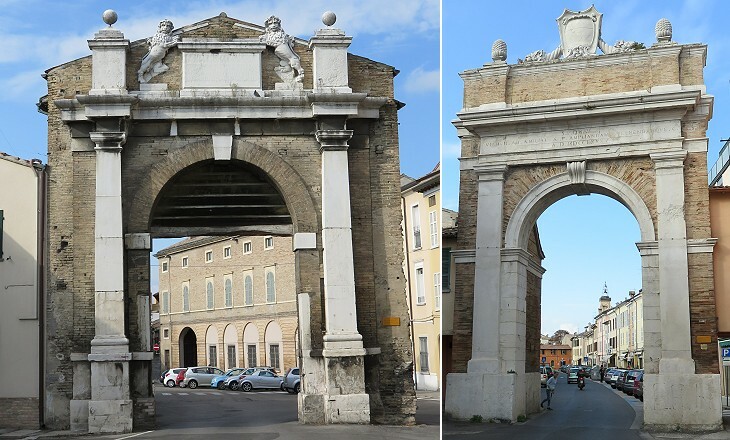 Porta Serrata was given its current appearance in 1650 by Cardinal Alderano Cybo Malaspina, Legate (governor) of Ravenna. 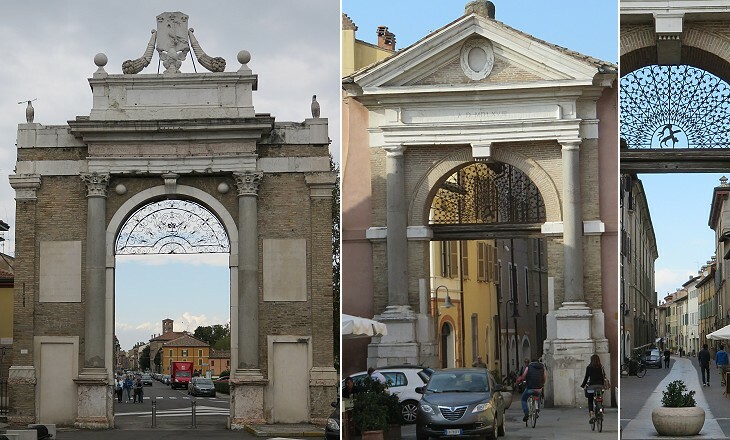 In 42 AD, during the reign of Emperor Claudius a celebratory arch was built at the western entrance to Ravenna. It had two passages and it was decorated with columns and marbles. It was named Porta Aurea (Golden Gate) after a golden round shield placed at its top. Most of its decoration was removed or damaged through the centuries and it was in such a precarious condition that in 1540 it was pulled down. 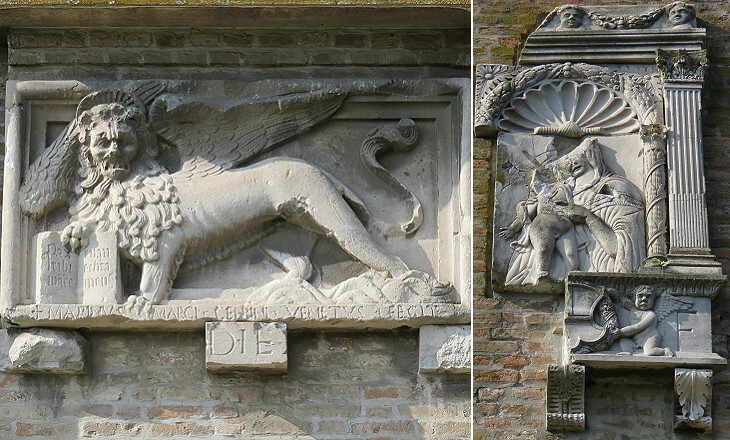 Some reliefs depicting symbols of the town were used to decorate Porta Adriana, a gate near S. Vitale which was redesigned in 1585. Porta Nuova was opened in 1580 and it was named Gregoriana after Gregory XIII, the ruling pope. It is situated in the southern part of the town on the road which led to Classe and Rimini. Its two grey granite columns came from Porta Aurea. In 1654 Cardinal Giovanni Stefano Donghi added the coat of arms of Pope Innocent X and the inscription Porta Pamphilia. He placed an eagle, his own heraldic symbol, under the dove of Pope Innocent X. You can see them better in a page dedicated to the papal coats of arms spared by Napoleon and his Italian supporters. 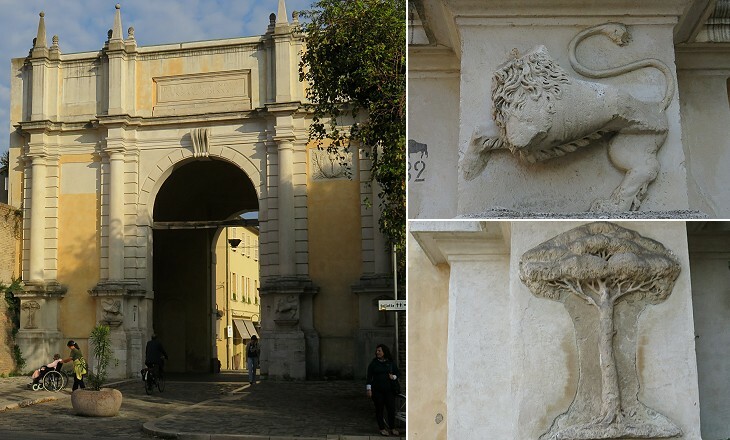 Porta Sisi is mentioned in a Xth century document and it is very close to the medieval heart of the town (the street beyond the gate ends at Piazza del Popolo). Similar to Porta Pamphilia, it was redesigned in the XVIth century and embellished with columns from Porta Aurea. Porta S. Mama owes its name to a lost church dedicated to St. Mammes of Caesarea which stood next to it. The medieval gate was rebuilt by Cardinal Domenico Rivarola who in the inscription made reference (hostium incursionibus devastam) to the damage caused to it by the French in 1512. The only gate on the eastern side of the town was rebuilt by Cardinal Giulio Alberoni in 1739 and was demolished in 1884. 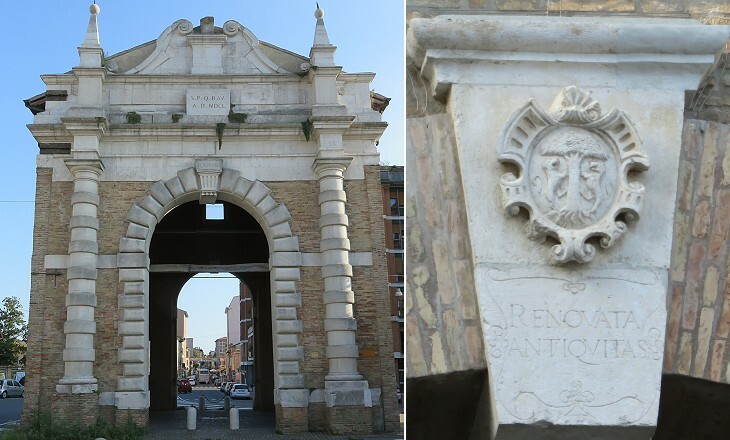 Portonaccio is the name by which a triumphal arch built by Cardinal Luigi Valenti Gonzaga is usually referred to. 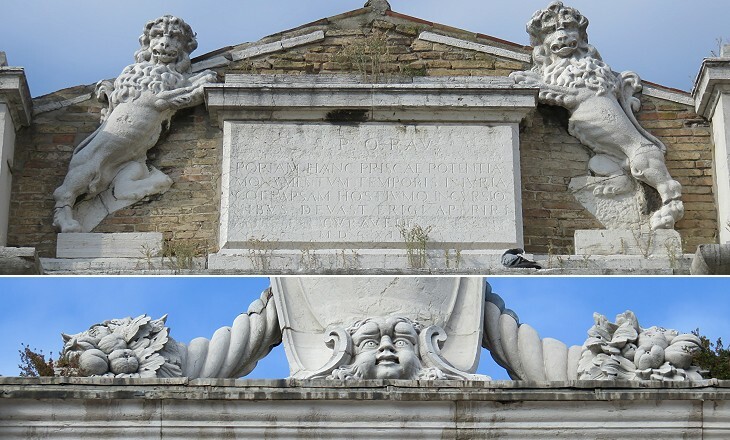 It celebrated improvements made to a neighbourhood outside Porta Sisi and it was decorated with an erased coat of arms of Pius VI, the ruling pope. Cardinal Valenti Gonzaga built the small chapel which houses the tomb of Dante Alighieri.